Bihar still represents rural India as urbanization is much less. There, the BJP lost elections. Similarly, in rural Gujarat, BJP lost heavily in district and taluka (block) panchayat. The following could be the reason: The government allocates large budget spending for rural area. Most of the population falls under beneficiary category. So, almost all people have direct interactions with local government and their officers. Clearly, people in the rural areas have a better perspective of government and its functioning than their counterpart living in urban areas. They have to suffer insult and injustice everyday. They have to pay hefty bribes for claiming their money government has allocated for them. Take the case of the National Rural Employment Guarantee Scheme (NREGS). Most often, those who work under NREGS don't get full wages. Part of it has to be paid towards bribe to get maximum days work. They don't get adequate ration, and quality is also poor. There are several schemes meant for their benefits and therefore they have to regularly interact with the government. They are smart enough to know the corrupt but helpless. During my work in tribal areas, I have noticed that, everyday, some or the other village leader has to go to taluka office, which is often 50 km or more from the village, almost everyday to make one or the other claim for the people. The real beneficiaries would hardly received 50% of the amount of what they are supposed to get. Political workers manage to get the maximum amount -- often 2 to 3 times what they are genuinely supposed to get. 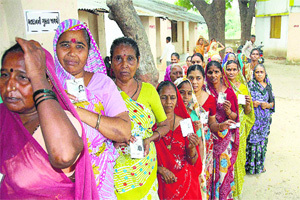 During my personal visit as a member of a fact-finding team of civil society in a village near Deesa, Banaskantha district, the team observed that the people who had really lost their houses in heavy rains and floods had received petty amounts of Rs 8,000 to Rs 9,000, though papers showed that the sanctioned amount was Rs 25,000. These were ordinary people not associated with the ruling party, BJP. However, some of the influential persons associated with the ruling party got cheques of Rs 90,000, and not only that. Three or four members of the same family living together got the same amount. That means that the influential family received lakhs of rupees. As for urban areas, citizens do not experience any direct interface with the government. Urban people are easily influenced by media and swayed away by lies of politicians. Most urban citizens do not know any of the candidates, when they go for voting. However, in the rural area, citizens know their candidates personally, because they have to take their help to claim their benefits. The election results suggest that it is a myth to believe that the urban voter is smarter than the rural voter, whom we call illiterate. This is extremely thought provoking article to me..I just heard NaMo Live in Silicon Valley during his recent visit to USA and was really impressed at his vocabulary and statistics he was showering all over the Audience.Most of us were literally mesmerised..However after reading these facts,from the article (Which only appears to be a tip of the Iceberg), my impressions have started taking a U turn.Slowly but Steadily,I have started digesting that "All that glitters is NOT gold ". Author deserves appreciation for smartly differentiating between smarter and so called illiterate voters.